Thorex.net provides the superhighway needed by holders of Bitcoiin B2G, and other cryptocurrencies like bitcoin. Thorex.net offers global autonomy, anonymity and security, allowing investors and traders across the globe a fully-functional cryptocurrency ecosystem. HONG KONG, CHINA, April 9, 2018 /EINPresswire.com/ -- Thorex.net (www.thorex.net) announces its fully-functioning cryptocurrency trading exchange1. Thorex.net is now available with instant wallet-to-wallet transfers. Thorex.net/Bitcoiin B2G Ecosystem: As part of the infrastructure developed around Bitcoiin B2G (www.bitcoiin.com), Thorex.net is a comprehensive trading platform, providing fast, safe, efficient transfers from wallet to wallet, and also from Bitcoiin B2G to original bitcoin, Ethereum, other selected cryptocurrencies, USD and Euros. Thorex.net provides the superhighway needed by holders of Bitcoiin B2G, and other cryptocurrencies like bitcoin. Instant wallet-to-wallet transfers are only part of the story. Thorex.net offers blockchain transaction posting in the 10-15 second range. This compares favorably with original bitcoin’s 10-minute trade execution. And without the scalability delays inherent in original bitcoin’s choked trading protocol, Thorex.net offers an expeditious transaction platform. Flat-Fee Basis: Thorex.net was designed to operate on a flat-fee basis. Thus, each Thorex.net transaction carries a fee of 0.5% per transaction. All traders need to do is enter the Bitcoiin B2G amount they choose to trade out of their Bitcoiin B2G account. Then, after specifying the blockchain address and providing keys, the transfer is executed. Built for Speed: Thorex.net was optimized to execute Bitcoiin B2G trades at maximum speed. Now that cryptocurrency2 Bitcoiin B2G has been activated on the global market, Thorex.net takes its place as a part of Bitcoiin B2G’s vision of a fully-independent, autonomous cryptocurrency, traded globally with efficiency, minimal process costs and absolute security. 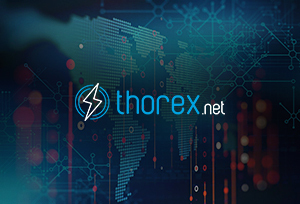 Thorex.net offers global autonomy, anonymity and security, allowing investors, buyers, sellers and traders across the globe a fully-functional cryptocurrency ecosystem. Thorex.net announces its successful launch, providing a fully-integrated autonomous trading3 and purchasing environment. Thorex.net was optimized to work together with Bitcoiin B2G, B2G Wallet, and Dragon Mining Technology. A Unique Opportunity: Cryptocurrency enthusiasts, depositors and adventurers continue to avail themselves of the opportunity to buy, sell and trade Bitcoiin B2G coins in an integrated cryptocurrency ecosystem, through Thorex.net. Thorex offers built-in controls, a global marketplace, and explosive upside growth potential. Thorex.net has assumed its place within the second generation of cryptocurrency. Catch the wave.